“Watch the timing when you start dating,” my dear friend warns me over coffee one afternoon. I laugh, assuming she’s joking. “Right?” I respond nonchalantly. Setting down her mug carefully her face becomes grim, “No, I’m serious. Think about it – you can’t start dating right before her birthday – that’s too much pressure!” My eyes widen, seeing her point. I add, “Or my birthday, that’s too much pressure too!” She nods, her raised eyebrows saying, See what I’m saying?” “I’m telling you, avoid all holidays when you start dating someone,” she cautions, taking a sip of her coffee. I glance out the window, noting the fall decorations lining the street. Suddenly, it hits me. “Wait! Halloween! Halloween is perfect! No pressure, you get to dress up and be completely silly for a night.” She puts down her mug slowly as a slow smile spreads across her face. We high five and look at each other like we’ve solved the world peace of dating or something. We nod at one another in silence as I mouth, “Halloween”. Dating over Halloween need not be frightful. Here are five Halloween dating ideas that are sure to be void of pressure and full of fun. 1. Go to a farm. Whether it’s going apple picking or choosing pumpkins at a pumpkin farm, spending time together outside in the fall is a lovely way to spend a date. 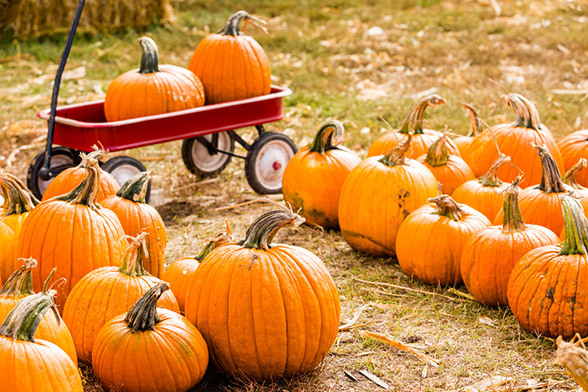 You’ll have the opportunity to stroll together sipping apple cider, or choose the perfect pumpkin for your front porch. The benefit of taking your date outdoors is that it gives you something to do on the date that allows you to get to know each other better, rather than sitting nervously across the table from one another in a restaurant. If you’re both into scary things, a haunted trail or haunted house could also be on the agenda, and give you an excuse to huddle close together. 2. Attend a community event. Many communities offer costume parties, hay rides, games, and other activities during Halloween season. In my community, the LGBTQ center hosts a fundraising Halloween party every year, full of costume fashion shows, live music, and cocktails. The benefit of attending a community event together is that it allows you to venture out as a couple, while also having the opportunity to meet up with friends – an important milestone in dating. Also, you might even have the opportunity to show off your memorization of the choreography for “Thriller” in a flash mob! 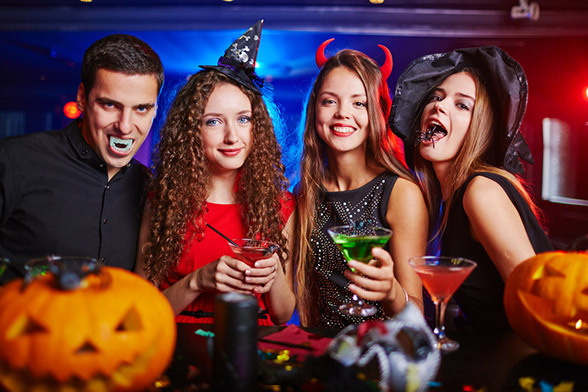 One of the best ways to have a date on Halloween is to co-host a party together. Planning a party can be a bonding experience and learning opportunity. Proper planning involves communicating about decorations, food, activities, guests, and figuring out how to share expenses around the party. These decisions are good practice for how you’ll handle larger decisions as a couple in the future – planning a vacation, spending time with friends and family, and sharing expenses. One tip for hosting your first party together – keep it contained. By inviting your friends and hers and co-planning the party, you’re introducing a lot of opportunity to learn about each other. By keeping your guest list manageable (under 8 in my opinion), you’re reducing the chances of misunderstandings and increasing the likelihood that it will be a fantastic success. If you’re fortunate enough to have kiddos in your life, whether your own, nieces and nephews, or friends’ kids, spending Halloween with children can be the most fun date of all. Babysitting together can also allow you to get to know each other not only in how you are around children, but in handling the unexpected – a spilled sippy cup, a leaky diaper, or over consumption of sugar. The best thing about babysitting on Halloween is that it’s a double win -you’re helping someone else go out and enjoy their Halloween, and you get to experience this odd tradition we call Halloween through the eyes of a child. One caution – depending on the age, some kids can be frightened of scary things. 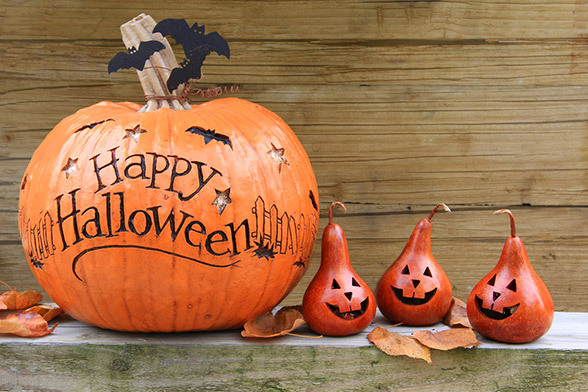 It’s best to talk to their parents ahead of time and make plans for fear free activities, like playing games, coloring pumpkins, or helping pass out candy to the non-scary costume-wearing kids. 5. Stay in and carve pumpkins. If staying in is your jam, putting on some music (or a Halloween movie if you’re brave) and carving pumpkins together can be fun and bonding. Over a glass of wine or fancy Halloween cosmos, helping each other design and decorate pumpkins allows you to practice your communication and see a lighter, fun side to one another. If you’re feeling up for it, you can roast the pumpkin seeds or make pumpkin zucchini bread also. Nothing says fall like the smell of yummy dishes baking in the oven. Halloween is the perfect opportunity for sharing a non-pressure filled holiday on a date. Whether you go out to a party, host your own, or stay in for a quiet date at home, Halloween dates don’t have to be scary. That is, unless you want them to be. For more online dating advice, check out our expert tips for online lesbian dating. Kim Baker is an author, online dating columnist, and blogger who has been writing for the LGBT community for ten years. Often described as the lesbian Carrie Bradshaw, Kim redefines dating through the lens of mindfulness and self-responsibility and offers a new model for healthier dating in her book Girls’ Guide to Healthy Dating: Between the Breakup and the Next U-Haul. When she’s not working or writing, she can be found reading, watching over the top humor movies or meeting a friend for cocktails and connecting. She enjoys running, spending time with family, dancing, and fashion. A Midwest native, Kim resides in Southern California with her partner and their codependent cats. Find her at www.girlsguidetohealthydating.com or on Twitter. Do Online Dating Tests Honestly Work?